Monte Carlo generators are used to simulate events produced at the LHC. They are extensively used for estimating the sensitivity of the detector to hypothetical signals and for estimating background processes, particularly from QCD and Electroweak processes. The generators are built around very sophisticated models of the "hard" parts of the interactions but, because of difficulties with extracting predictions from QCD for the so-called "soft" interactions, they are in need of supplementary phenomenological models whose parameters need to be tuned to match the data. The group is involved in producing such tunes. The plot on the left shows a typical tuning variable (in this case the average sum of the transverse momenta (pT) of particles in the event as a function of the pT of the highest-pT particle in the event compared to various generator tunes. 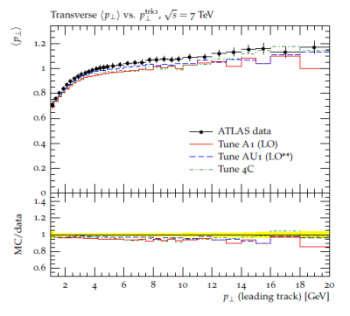 In addition to tuning the generators, the group is also responsible for maintaining the interfaces between the generators and the ATLAS analysis software.